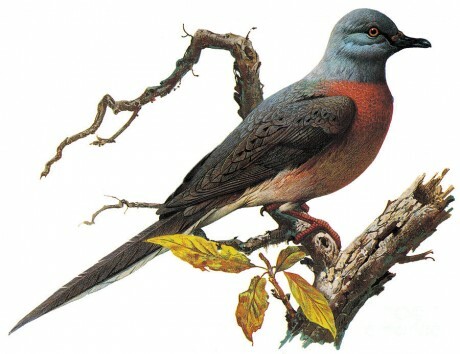 What Happened to the Passenger Pigeon? Throughout the 19th century, passenger pigeons were the most abundant bird in North America. Named after the French word passager for “passing by”, the species numbered an estimated 3 to 5 billion birds when Europeans arrived on the continent. The species lived primarily east of the Rocky Mountains, and bred almost exclusively in the eastern deciduous forest. In Wisconsin alone, in 1871, there were an estimated 136 million breeding passenger pigeon adults in the state. Historical accounts of their huge flocks are numerous. It is reported that they darkened the sky for hours or even days at a time as they took to the air. But because the birds lived in a limited number of extremely large flocks, this gave the impression that there was an unlimited abundance of the birds and the birds could be harvested at will. The bird’s population began to decline in increasing numbers as a result of European settlement in America, due at first to deforestation and habitat loss later as a result of unregulated hunting. Pigeon meat was subsequently commercialized as “cheap meat” for slaves and the poor in the 19th century. As a result the species went from being one of the most abundant species in the world during the 19th century to extinction in the early 20th century. This year marks the 100 year anniversary of the passenger pigeon’s extinction.